This No1 dad key ring is a a wonderful accompaniment to daddies keys, it opens with a clasp and can hold 2 x pictures of his loved one inside, it is finished with a polished silver. 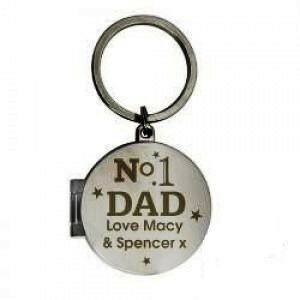 You can personalise this No1 dad Photo Key Ring with up to 2 lines of 15 characters. Ideal for New Daddies, Fathers Day, Birthdays and Christmas.